Creating picture books that are supposed to attract young children to the Bible is an interesting idea but I'm not all together convinced it is a good one. Cute little rhymes that are supposed to make us think about fluffy bunnies being pet by cartoon-ish figures with round noses lack balance, I think. Nor do I think we need to create oil paintings depicting the cross in all of the detail to give small children a vivid visual. God told His story in words. He didn't leaves us artwork so that our modern minds would take comfort in the fact that there are illustrations scattered throughout. Only certain people in history were permitted to a visual. The rest of us must believe with faith and words.) Personally, my preference is to tell God's story to our children and let their minds make their own pictures (providing they are accurate ones that suit their maturity levels). 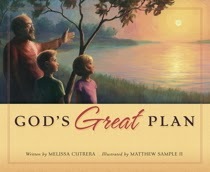 All that explained, I think God's Great Plan , written by Melissa Cutrera and illustrated by Matthew Sample II, is fairly decent. Even though it is told in rhyme. First, I think the rhyme is theological solid. It opens with the creation of the world, tells the story of Adam and Eve and their downfall, which eventually resulted in their being cast out of the Garden of Eden. When people decided to go their own way. Break God's commands and serve only ourselves. Because we ignore Him again and again. To rescue His people was always His plan. Who took on Himself all the wrong that we've done." That explanation takes us from the Old Testament to the New which discusses the fact that God became a man and came to earth to offer a perfect sacrifice for our sins. The picture book concludes with Jesus' resurrection from the grave and ascension into Heaven. The illustrations in this book are tasteful, I think. They aren't cartoon-ish and (bonus!) the author does have skill in illustrating a human being without making the faces appear constantly somber and distorted. (I'm clearly jaded when it comes to religious picture books.) I think Sample creates photos which depict each part of the story fairly well, making the page spread wherein Adam and Eve sin and/or the crucifixion dark but not frightening in such a manner that a kid can barely stand looking at the page for fear. Most pages are bright and quite lovely to look at. Truthfully I've rather given up hope that Christians care to create picture books which are beautiful and lovely and truthful all at once. But God's Great Plan gives me hope. I think that it's very nicely done (except the rhyming kinda gets to me...) and don't mind featuring it as a recommendation to you as well. If you have any further questions about this book please leave a comment below and I'll do my best to answer accurately for your benefit. I know that such a book can raise eyebrows and many Christians would likely come to the conclusion that they'd rather not use this picture book in explaining the Gospel to their kids. That's fine and I have no problems with that. I'm pretty choosy myself! But for those of you who are looking for such resources, I wanted to make this one known to you. I've liked it better than any other I have seen (so far). Many thanks to Shepherd Press for sending a copy of this book for the purposes of facilitating this review. I received no additional compensation for this post and these are my honest thoughts. Should you doubt it. I like the illustration on the front. I don't like religious picture books that are cartoonish or too cutesy. Admittedly, I love rhyming, cutesy books! (to an extent, anyway...it has to be Biblically sound) I DO try to add balance and (non-horrifying) realistic pictures in the mix, too, though. I'll have to check this one out.